Was waiting for this PA Block bolt to strip, but it snapped instead! This is a first. I had to use a punch to drive out the rest. It unscrewed right out of the Sump Base no problem, but needed to be beat out of the PA Block. 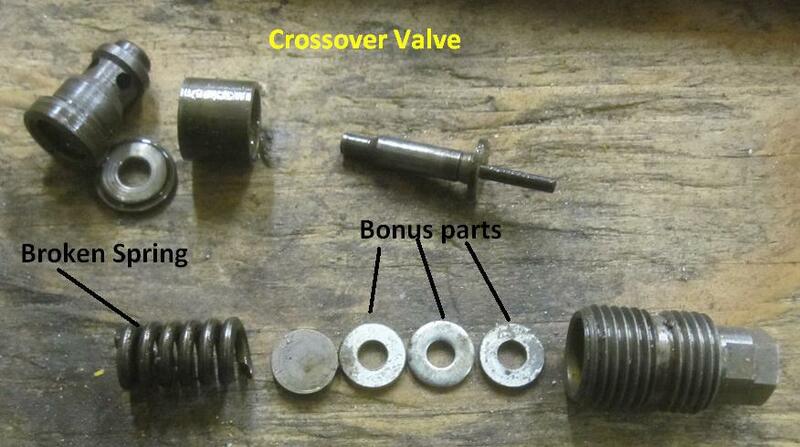 B Valve came out in pieces. It is not common, but it is not a 1 in a 100 occurrence either. Seems the snap ring wears thin, and lets go. All I can figure is the valve stem must spin, and over the years, wears the snap ring. No big deal to pluck out the piece in the block. It happens to the C Valve too sometimes. THAT can be more of a PITA to get the piece out. Customer dropped this off in NOVEMBER. I told him we were backed up and not accepting pumps for rebuild. I finally got to it, and because he was not a pest about it, I sandblasted it and painted it for him at no charge. Oh, and the pump he dropped off I pulled the PA Block off of, the rest of it was complete junk, so this is a core with his PA Block on it. Picture dated January 25, 2013. Customer bought this unit off Craigslist. He brought it in to be checked out. I ran it up and down on the test stand, and fluid squirted out from under one of the top cap nuts. BLACK fluid at that. HE opted to have it rebuilt. 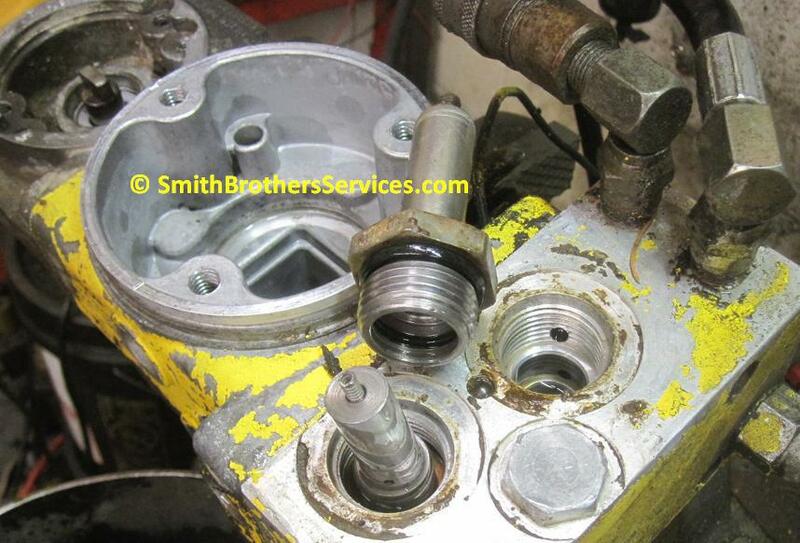 It seems when the Sump Base was replaced, they re-used all the O Rings. 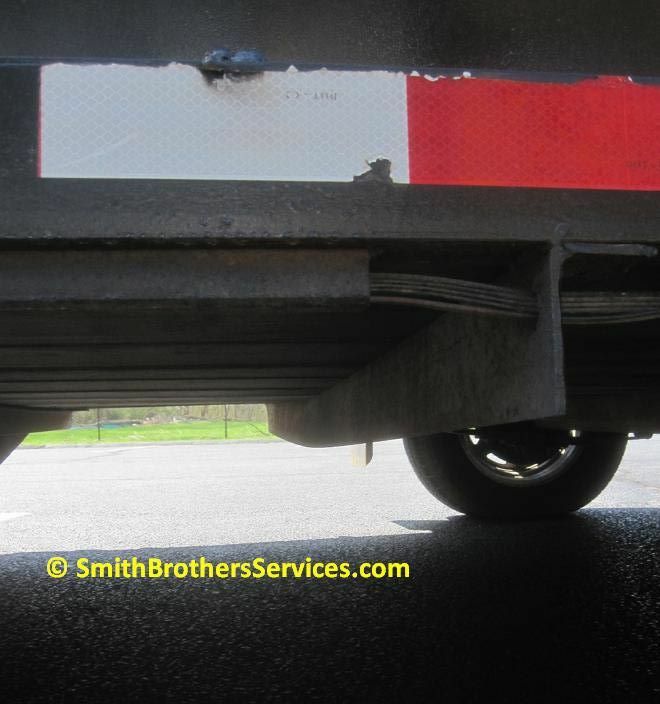 They also left out the plastic baffle inside, which may be why fluid squirted out the top when the unit was lowered. 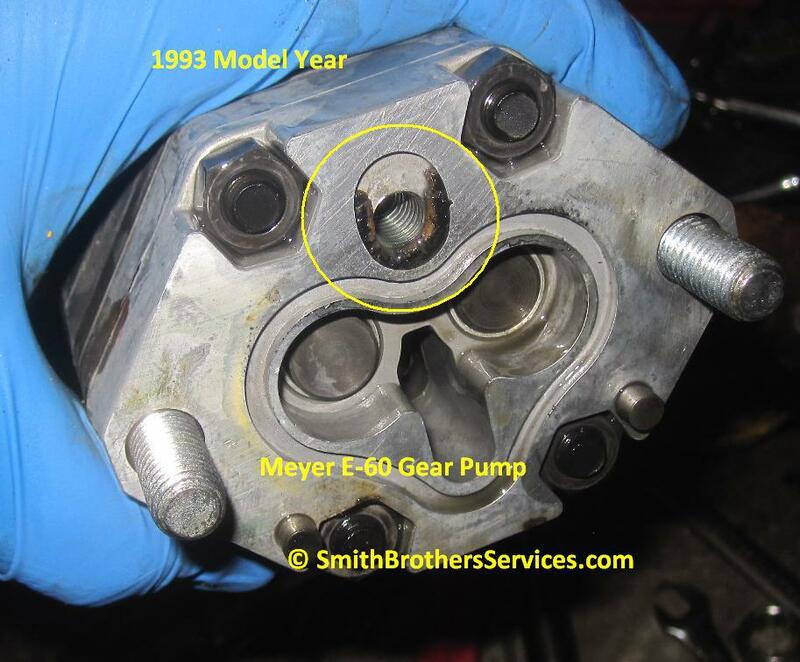 I also found defective studs (that Meyer made us aware of YEARS AGO) holding the pump to the Sump Base. Here it is all done on the test stand. 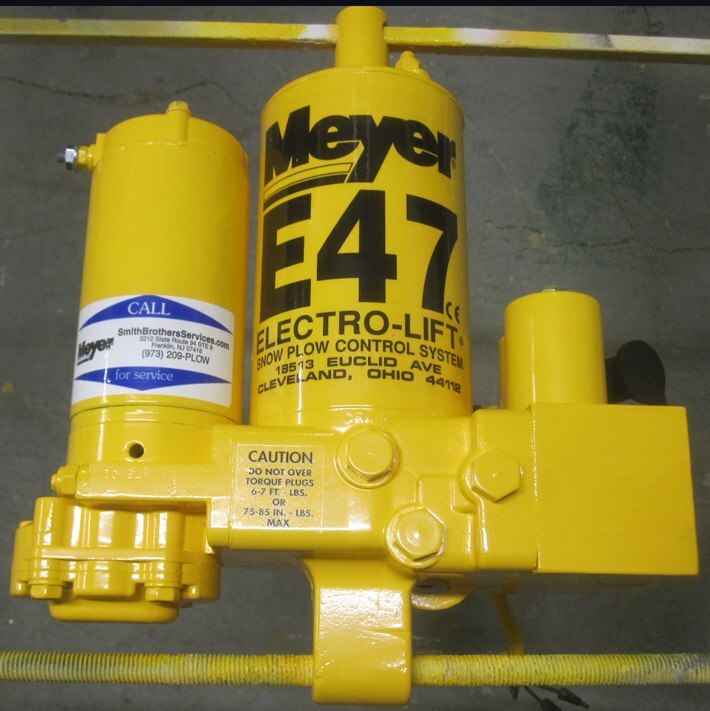 AWESOME, 2000 psi and ONLY drawing 160 amps! These are the defective studs. 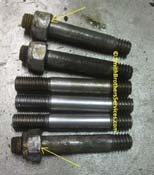 They were not threaded far enough. The nuts bottomed out before the pump was fully secured to the Sump Base. There was clearly a leak into the cavity between the Sump Base and the Pump. The O Rings were also starting to blow out. There is a Meyer Service Bulletin about this problem. This is from an E-60 core I am rebuilt for sale. I was shocked that it was a 1993 model year, yet so much of it looked brand new inside. I wonder how early on this O Ring blew out. 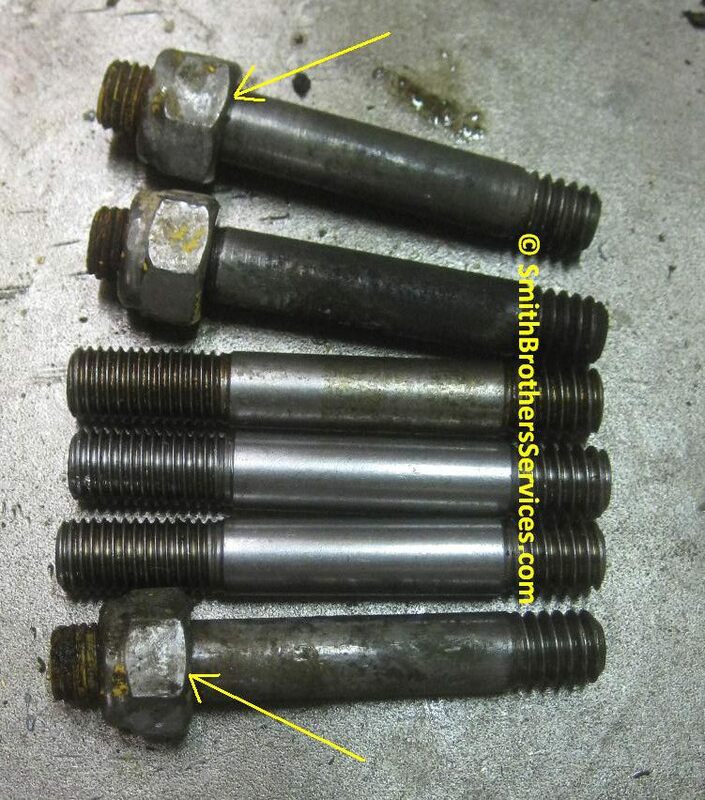 This is why it is SO important to completely disassemble a unit when you rebuild it. 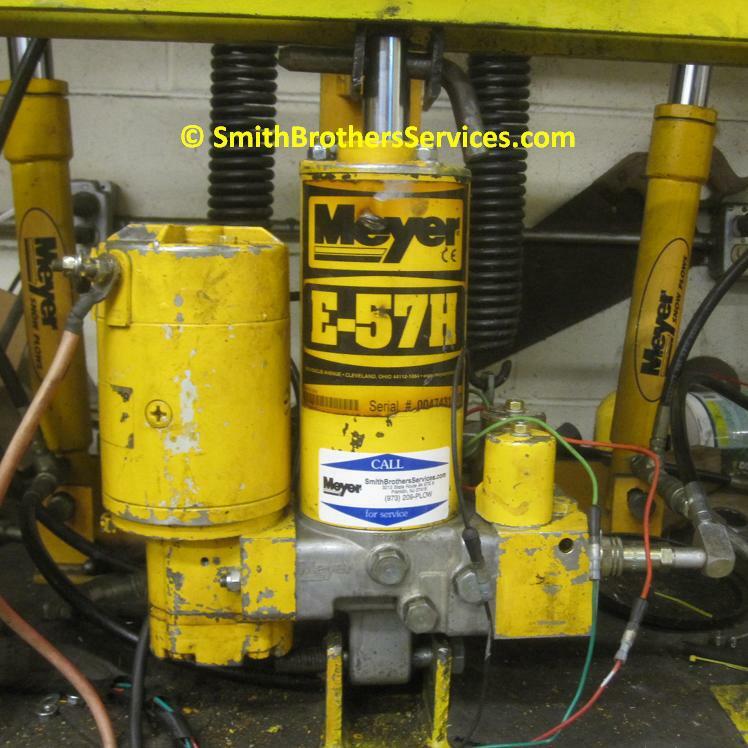 Yes, it can be a real pain to get the E-60 pump back in, but if you don't remove it, you will have no choice after you have it all back together and it won't build pressure. May as well do it right the first time Eh? I learned my lesson with these years ago. Customer dropped off two units. This one was "do the bare minimum" to get it working. On the test stand it went about half way up, and no more. I did not want to contaminate the stand so I only checked raise. Sounded low on fluid. Drained it and it seemed very low on fluid, very milky. Symptoms were no raise, no angle. Well that was in the single digits outside. So... Shot a whole can of brake cleaner into the tank and blew it out, as in, spray for 10 seconds, blow out crap with air. Spray, blow it out., etc. Refilled unit, put it on the stand, and then it was clear the lift ram packing was shot. Opened the unit up, and while there was no crap in the sump base, looky here... THIS is why we THROW AWAY the suction screen whenever we rebuild an E-46/47/57/58H. I am not even sure what this crap is! I am leaving it intact to show the customer... The reason I mentioned he dropped off two units is because the second one was "whatever it needs, fix it" so lo and behold, the same thing, suction filter almost plugged solid. 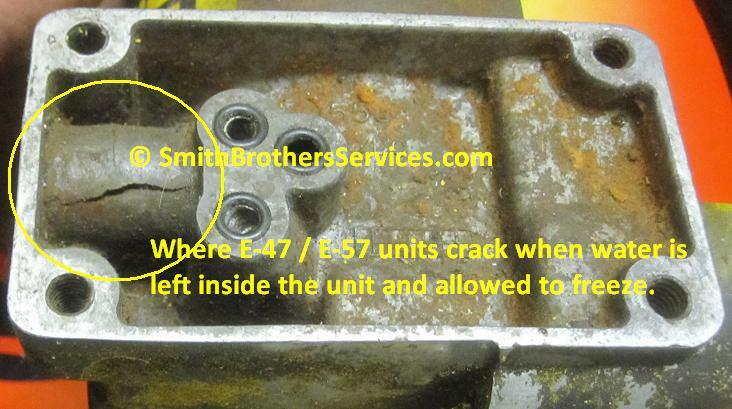 This is a great example of where E-47's crack. 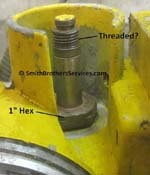 Water gets in the system, and when allowed to freeze, it cracks the high pressure port. The main symptom is oil leaking between the Sump Base and PA Block. It is not the O Rings leaking.. 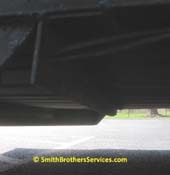 Sometimes the crack is harder to see, but if oil is pouring out between the Sump Base and PA Block, this is where it is cracked. 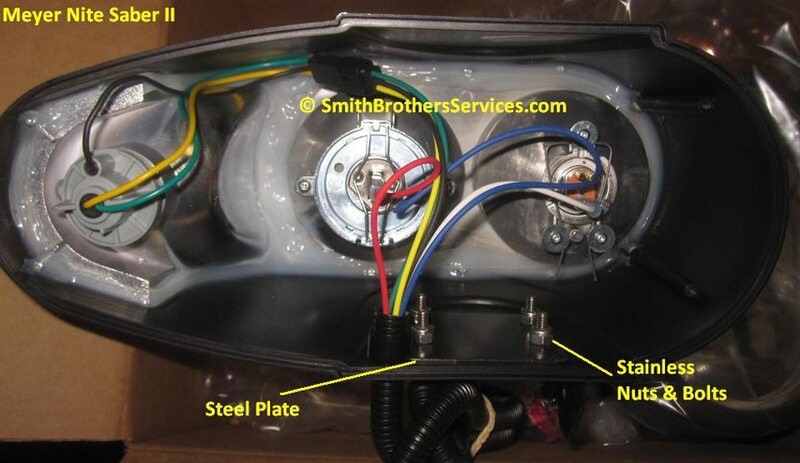 Inside of a Nite Saber II light in case you ever wondered. Gotta love bonus parts. Spring ws broken so some genius used washers to take up the space. 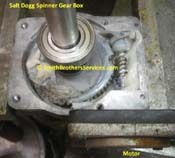 Had to open up a Spinner Gearbox off a Salt Dogg poly hopper spreader. Everything was fine inside, figured I would share the pic. 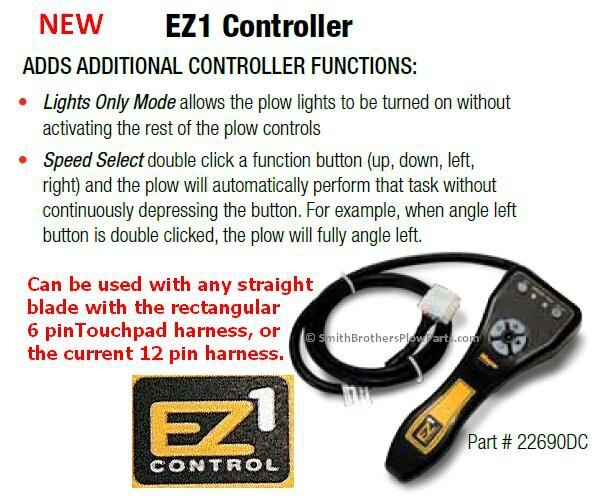 The Meyer EZ1 Controller is now standard on all straight plows. I have never had an A Valve that required a 1" socket to remove it. They are ether 7/8" or 1-1/8". This one also has a second set of threads on the stem. 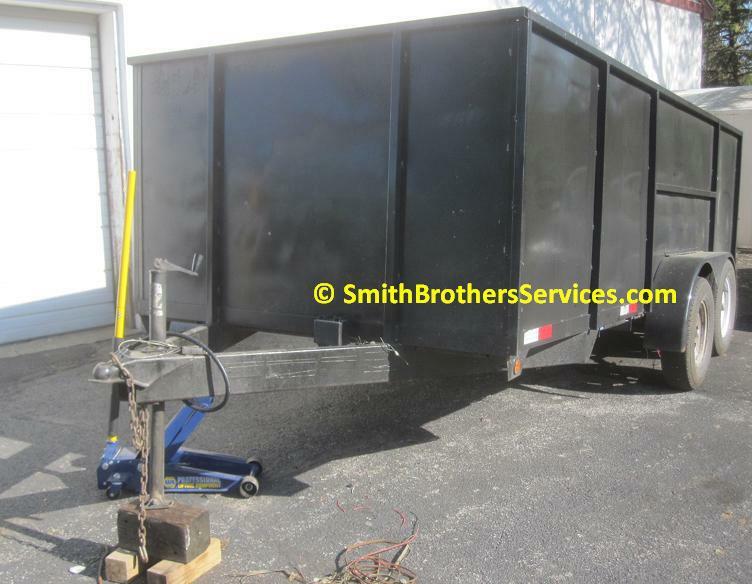 Good idea for an old open trailer. Put 4' high sides on it, and use it for mulch. 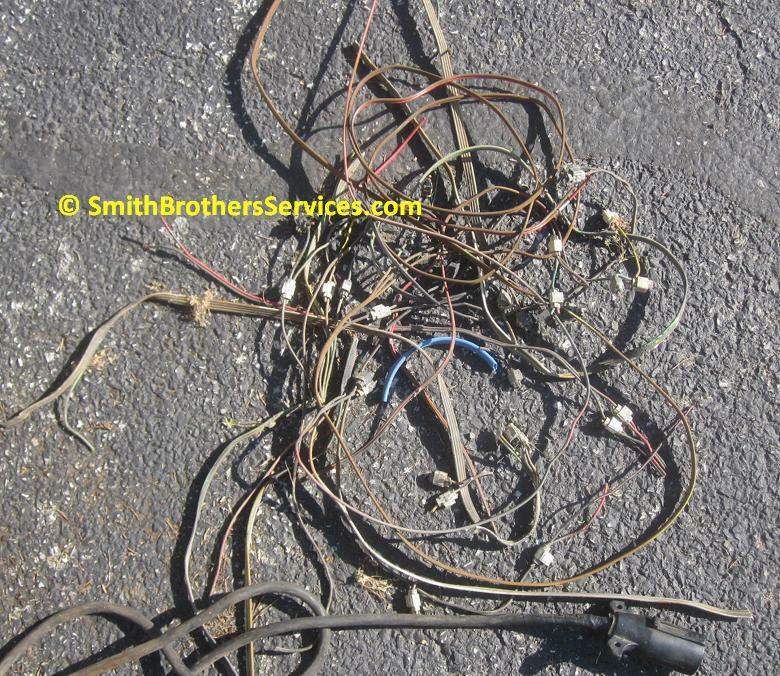 It is here to be completely rewired. 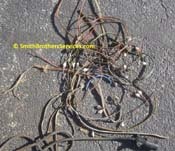 With trailer prices where they are, the manufacturer should be ashamed of themselves.... 34 quick splice connectors!! Not anymore. E-47 Rebuilt and painted. Ready to be picked up. April is gone and May is going by fast already. 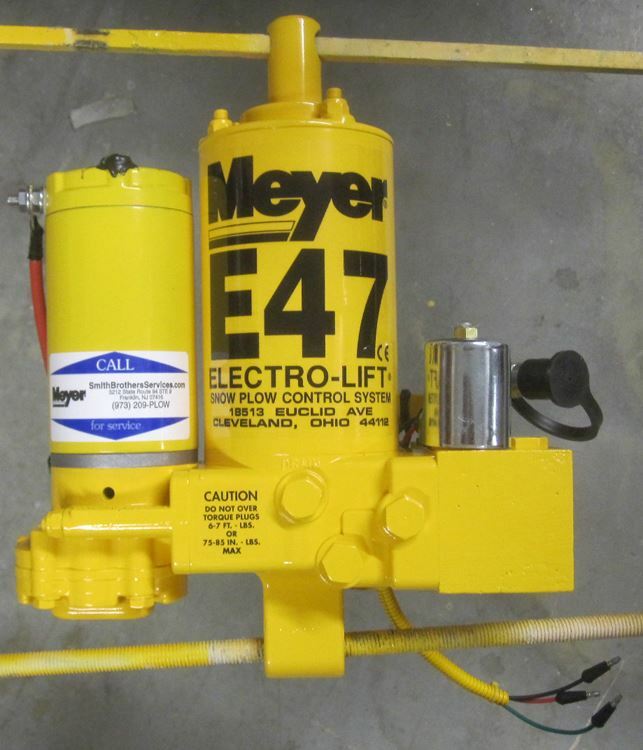 If you want your pump rebuilt, remember the price goes up every month from now until September. Right now you can save $100 - $130 Don't wait!